Taipei, Taiwan (March 2019) – ATP Electronics, the leading manufacturer of “Industrial Only” memory and storage solutions, showcases its broad and own designed and manufactured product portfolio for the embedded Internet of Things (IoT) at the 22nd Embedded Systems Expo (ESEC) of Japan IT Week Spring 2019 from April 10 to 12. The exhibition is the largest of its kind in Japan and is expected to gather 40,000 embedded systems engineers and professionals who are interested in IoT technologies. The exhibition will be held at the Tokyo Big Sight, with ATP Electronics at West Hall Booth No. 1-4. The IoT ecosystem generates huge amounts of data and many mission-critical applications demand near-real time data storage and access to transform intelligence into insight. ATP’s M.2 NVMe and SATA modules as well as 2.5” SSDs offer the performance, speed and endurance required to collect and store massive volumes of data generated by sensors. Lean and robust, these SSDs fit well in space-constrained and fanless embedded systems. SSDs with industrial temperature rating deliver sustained performance even in sub-freezing or extremely hot operating environments from -40°C to 85°C. Additionally, ATP NVMe SSDs feature ATP Dynamic Thermal Throttling, which intelligently adjusts performance to prevent overheating. The ATP industrial e.MMC, meanwhile, is a soldered-down solution including advanced technologies within a tiny package, such as SRAM Soft Error Detection and Sudden Power-Off Recovery (SPOR), a firmware-based power loss protection mechanism. Security is a top priority in embedded IoT. ATP is taking security very seriously, employing advanced AES-256 firmware-based encryption in its SD and microSD cards to make sure that embedded systems or hosts will not accept unauthorized cards with unlicensed content. ATP’s secure memory cards are best used in applications where authorization of storage device is required for content access, such as point-of-sale (POS) systems, navigations, digital signages and devices storing application programs. ATP’s A1 3D MLC memory cards deliver exceptional agility with their A1 Application Class Performance rating. Key advantages include 93% lower write latency, 1500/500 IOPS for 3X higher random read/write performance than standard UHS-1 cards, 53% lower power consumption and robust durability to withstand environmental and power challenges. in-vehicle infotainment (IVI), event data recording and Advanced Driver Assistance Systems (ADAS). Industrial IoT is expected to bring about an avalanche of data from connected devices. The relentless generation of data necessitates collection, processing and analysis, some of which will be needed in real time while others will be done in the cloud. From the latest DDR4 modules with interface speeds from 2400 up to 2933 MHz, ATP’s extensive range of DRAM products are capable of meeting amplified data challenges with enterprise-level density and reliable performance for memory-intensive workloads. committed to supporting requirements for DDR3 modules over the long-term. By providing its own DDR3 8 Gbit components for these modules, ATP is assuring long-term consistent supply for its customers still using specific DDR3 memory such as VLP RDIMMs or high-density SO-DIMMs. ATP also continues to manufacture select DDR2/DDR1/SDRAM modules under a partnership agreement with Micron Technology, Inc. for customers that continue to use platforms supporting these memory types. The expanding varieties of connected devices in the embedded IoT/IIoT era require memory that will improve processes and productivity. ATP DRAM modules are meticulously tested from integrated circuits (IC) to module and are engineered for rugged, rigorous use in demanding industrial applications. Wide (-40°C to 85°C) or extended (-40°C to 95°C) temperature support, conformal coating to shield against the elements, 30µ"-thick gold finger plating and anti-sulfur resistors are just a few of the many ways that ATP DRAM modules ensure peak, dependable performance in any environment. 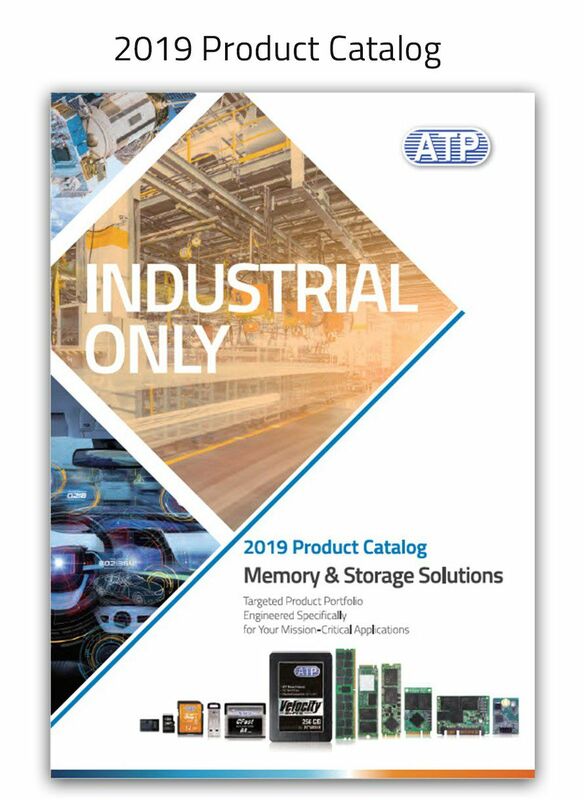 To know more about ATP’s “Industrial Only” memory and storage solutions for the embedded IoT, visit ATP at West Hall Booth No. 1-4. For inquiries, please contact ATP regional sales, distributors, or send an email to Info[at]atpinc.com.